This delicious pizza will be well worth the effort. The tomato sauce recipe will make more than you need for 2 pizzas – freeze the spare for another day. The sauce is perfect as a base for any pasta dish. 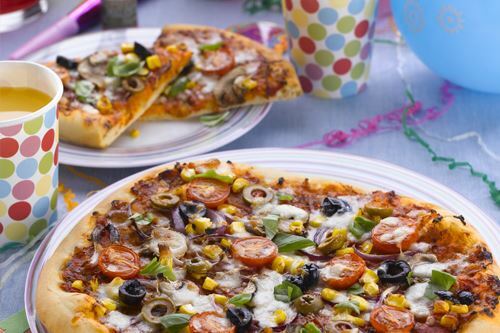 If you want to freeze one the pizzas, remove from the oven when almost cooked, allow to cool thoroughly then wrap in cling film and place in the freezer. Makes 2 large pizzas (serves 8). Preparation time 45 minutes. Cooking time 20 minutes, plus 90 for the dough to rise. Place all of the ingredients into a bowl and mix using your hand. As the dough starts to come together turn it out onto a lightly floured surface a kneed for 5 minutes. The dough will start to become elastic as you work it. Lightly oil a clean bowl and place the dough in it then cover with a clean cloth and place in a warm spot to allow to rise for 90 minutes or until doubled in size. While the dough is rising prepare the sauce. In a large saucepan gently fry the onion, celery and carrot for 5 minutes then add all of the remaining ingredients. Simmer for 20 minutes then blend with a stick processor. Season as required. While the sauce is simmering move to the toppings. Roast your veg for greater flavour. Place the first set of toppings onto a roasting tin, add a little oil and cook in a pre-heated oven 180C for 20 – 30 minutes. When cooked set to one side. Dust your work surface with a little flour and roll out the dough. Place both rolled out dough onto the baking sheets. Top the dough with some of your tomato sauce leaving a small edge. Divide your roasted vegetables between the pizzas. Finish your pizza with olives, mushrooms, cheese and a sprinkle of herbs. Optional extras that will add a real punch of flavour such as chillies, sundried tomato paste, chipotle paste, artichokes and or capers can be added. Bake your pizza at 240C (so a hot oven!) for 12-15 minutes or until bubbling on the top and golden. If you’re time is limited, you can use a good quality tomato sauce instead of making your own, and ready roasted peppers are available.